The U.S. duopoly electoral structure is in deep crisis, as Donald Trump consolidates his appeal to the unapologetic racist core of the Republican Party and Hillary Clinton rides the Black vote to inevitable victory in the Democratic camp. Both parties, as presently constituted, are inherently unstable, and the GOP is already imploding. If there are two “Republican” parties in orbit, then the “Democratic” half of the duopoly will also lose its moorings and equilibrium, even though triumphant in November. Thanks, Donald Trump. Although the Democrats may avoid an open rupture with the Sandernistas in Philadelphia this summer, Hillary Clinton’s corporate machine will move quickly to reposition the party to the right in November so as to absorb the white “moderate” exiles from the Republican rubble – thus, further alienating Bernie’s insurgents. Black voters, who are fully aware that they saved Clinton from ignominious defeat in the early primaries, will in very short order be pushed back in their “place”: the captive constituency. But this, too, is unsustainable if even half of the duopoly comes undone, because the duopoly system is the cage that traps Blacks inside the Democratic Party. As long as there is a monolithic GOP playing the role of the White Man’s Party – as has been the case since 1968 – Blacks will feel compelled to huddle within the Democratic half of the duopoly. The impending GOP split would not create a new Republican-type brand that would be attractive to Black Democrats: rather, it would be a haven for whites that cannot support Trump. The Democrats are hoping that the Trump phenomenon will give them the opportunity to create a kind of “super-party” that would corral almost everyone except the most racist elements of the white electorate. In practice, that means Clinton and her corporate crew are already gearing up to lure hordes of panicked white “conservatives” that cannot, for one reason or another, stomach Trump, into the Democratic “big tent.” That’s why, in the near term, the split in the GOP will result in a more pronounced attempt by the Democratic Party leadership to shift to the right, which is their intention in all seasons. The Democrats don’t “drift” rightward; their modus operandi is to hug as closely as possible to the Republican troglodytes, keeping just enough to the “left” of the GOP to give the appearance of an ideological contest. 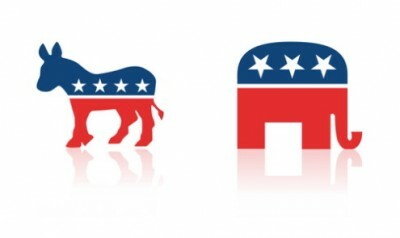 Under a new electoral configuration – Trump Party vs Old GOP vs Democrats – the natural inclination of corporate Democrats would be to woo the more polite conservatives of the Old GOP to their tent. If recent history is any guide, Black Democrats will still be reveling in their status as saviors of Hillary’s career, President Obama’s “legacy,” and the whole world – from the demonic Trump. The Black Misleadership Class will take credit for the meltdown of the GOP-as-we-have-known-it, even as Clinton schemes to accommodate displaced and disoriented white Republicans in the Democratic fold. The Dem-Rep duopoly might, however, soon start to collapse at both ends. Once the two-party arrangement has been fractured on the Right – as has already begun – it will likely splinter on the Left, as well. Bernie Sanders’ troops are keenly aware that the polls show he runs better against the Republicans than Clinton; that he is the most trusted of all the candidates, while Trump and Clinton are the least; and that majorities of Democrats favor Sanders for the nomination. The senator from Vermont may fully intend to endorse Clinton in Philadelphia, but his followers despise her. If Clinton is perceived as insulting the Sandernistas or their leader, there could still be a revolt on the Democratic side of the duopoly. Both conventions might resemble Chicago in 1968 – and it couldn’t happen to two nicer parties. If the Republicans split in two, they won’t seem so formidable that Black folks will feel it necessary to cower under the Democratic umbrella, in search of protection from the White Man’s Party. The Black Misleadership Class, whose allegiance and fortunes are tied to the Democrats, would begin to lose its leverage within the community, and the Black Radical Tradition could once again find its voice. So please, white Sandernistas, strike a blow for Black liberation. Trash the Democratic Party! Down with the Duopoly!